On An Overgrown Path: Are concert halls the new recording studios? Are concert halls the new recording studios? This could indicate that the center of economic activity in classical music is no longer records but live events. On top, concert halls are the new recording studios and EMI LBO [leveraged buy out] was doomed from the start. That comments was added by Antoine Leboyer to What price Mahler? Now Antoine is one of the few bloggers still writing what he thinks rather than what big music wants him to think and I can't disagree with his point. But the eclipse of the studio by the concert hall as a recording venue has many implications. Live recordings have been around for ages. But how many of your all time favourite discs come from concert recordings? A quick scan across my well-stocked shelves identifies only two, Richter and Gavrilov's Handel Suites and Bruno Maderna's Mahler Nine. Just recently a musician friend was lamenting the compromised technical, musical and emotional quality of the new generation of orchestra label live recordings. This guy has good ears and he questioned the ability of these live recordings to withstand repeat listening, saying "Fine as a substitute for being at the concert, but not as a substitute for a great studio recording". It is an important point, how many live Mahler recordings will still be in the catalogue almost fifty years after release? Except for recordings of live performances concert halls, like for example London's Barbican which is used for many LSO Live recordings, are rarely used for sessions for the simple reason they do not have the unique acoustic properties needed for top quality recorded as opposed to concert sound. (One notable exception is Snape Maltings which Britten created as a dual purpose hall, but it is small as a concert venue). So the compromised sonic properties of concert halls coupled with the problem of audience noise (listen to those Handel Suites) opens the door to close miking, digital reverberation and other trickery - heard that one before? It may just be semantics, but I think my headline shouldreally be 'The recording studio is dead, we are going to have to live with concert halls'. * Header image tells a fascinating story. 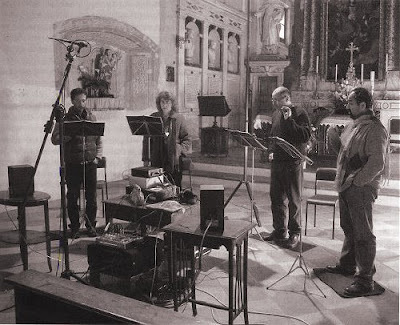 It is from a wonderful CD by the vocal group Cantica Symphonia titled Stella del nostro mar - Past and present reflections of the Marian inspiration and it was made for the enterprising independent Spanish label Glossa. The disc is remarkable for its glorious juxtaposition of the ancient and modern, with the latter represented by contemporary composers Carlo Galante and Yakov Gubanov. It is even more remarkable because no engineer or producer was present for the sessions in the church in Colletto, Italy. Engineering and production credits go to the group's tenor Giuseppe Maletto who also operated the recording equipment seen in the foreground of the photo. Let me hasten to add that there is no compromise at all in the quality of the music making or sound. Stella del nostro mar is quite one of the most ravishing discs I have heard for a long time, helped I am sure by the distant position of the microphones seen in the photo and the long takes mentioned in the excellent accompanying booklet . So is it goodbye Concert halls are the new recording studios and hallo Musicians are the new production team? Let's see...Well, the majority of Furtwängler recordings. Since he hated the recording studio, Furtwängler's live recordings have an energy and mystique unparalleled. The same can be said for Toscanini's NBC concerts and especially for Bruno Walter's live performance of Mahler's Das Lied von der Erde (issued by EMI, no less). Yes, these are historical recordings. But, in my ears--ears that have produced studio recordings as well as live concert recordings--performance trumps technology. Now, how about some more modern examples? Well, Bernstein's Beethoven Cycle for DGG: live. Frans Brüggen and the Orchestra of the 18th Century performing Suites from Rameau's Les Boréades and Dardanus: live (a desert-island disc). Same coupling performing Nozze di Figaro Overture and Symphony No. 38: live (another desert-island disc). The other major importance, for me, of live over studio recordings is the fact that live recordings will have far fewer edits and are therefore more performance than pastiche. I can't, and don't, give a damn about a flubbed note here or there. The real curse of the recording industry has been the idea of total sonic perfection. It. Does. Not. Exist. Get over it, people, and listen to the MUSIC! There was an interesting experiment tried a few years ago, though, by a label called Eye Of The Storm, which attempted to provide two "takes" of each work presented on disc (and, therefore, making each set a 2 CD package), as edit-free as possible, in order to give the impression of how different any two performances of one work by the same artists can be. David, fair comment. At least this post has sparked a debate about an important and these days largely forgotten topic, the quality of recorded sound. You are quite right about valuable historical live recordings and I should have mentioned those. But the subject of the post was the new generation of live orchestra label recordings. It is not just a question of "a flubbed note here or there", which are covered by multiple takes anyway. For many including me, when we listen to the MUSIC these live recordings lack the frisson of great studio recordings. I'd be interested to hear David how many LSO, SFS or equivalent live recordings you have in your collection and whether they rank alongside the recordings you mentioned. I think, Bob, that the problem with some of these newer LSO recordings, or that of many major orchestras, is that the lack of frisson lies as much, if not more, with the performances than with the way they were recorded. Sure, there are bad live recordings. But there are just as many bad studio recordings. And, an uninspired performance is an uninspired performance, whether it is a studio session or live.